Select the Memory option from the gage menu as shown. To adjust a parameter use the up and down buttons to move the highlighting bar to the appropriate parameter, then use the (+) and (-) buttons to adjust that parameter. MIN: the specified minimum thickness value for the coating system. If only one target thickness is specified, set the MIN to that value. Adjust the displayed value down (-) or up (+). Alternatively, measure a coating with a thickness close to the required value and make final adjustments with the buttons. MAX: the specified maximum thickness value for the structure. This value should be that thickness above which adverse performance characteristics appear, such as mudcracking, embrittlement, solvent retention, loss of adhesion, cohesive splitting, etc. If a maximum thickness value is not specified, set the MAX value to 0. 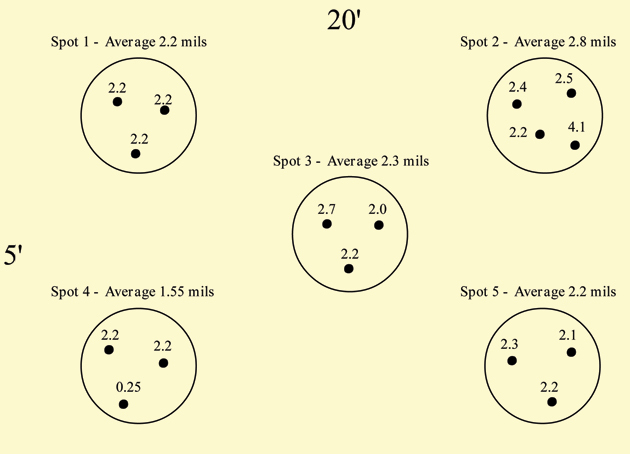 #/spot: the minimum number of individual gage readings required per spot. 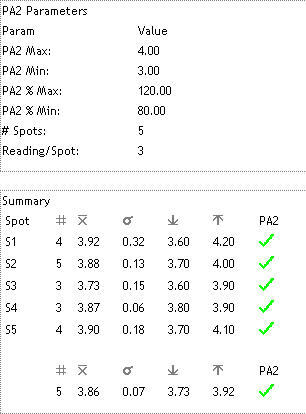 PA2 suggests a minimum of 3 readings be taken. Adjust the displayed value down (-) or up (+). spots/batch: the minimum number of spots (sub-batches) required per batch. PA2 suggests a minimum of 5 spots be measured. In any measurement there is a certain level of uncertainty. Two people using the same gage will not necessarily record the exact same number for a given spot measurement using the same 4cm (1.5inch) diameter circle. To allow for this natural fluctuation, an individual spot measurement is permitted to be below the specified minimum thickness as long as other spots in the batch area are high enough to make the average thickness meet or exceed the specified minimum thickness. Similar reasoning applies to maximum thickness. % MIN: PA2 specifies that no single spot measurement be less than 80% of the specified MIN thickness. 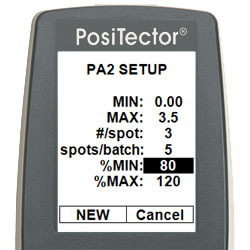 The PosiTector 6000 allows this value to be changed if desired. % MAX: PA2 specifies that no single spot measurement be more than 120% of the specified MAX thickness. 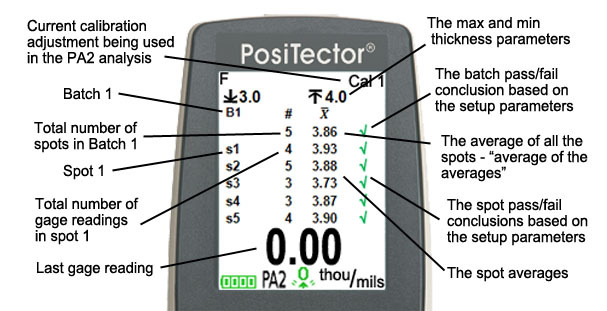 The PosiTector 6000 allows this value to be changed if desired. If the MAX value above has been set to 0, this % calculation is made to the MIN value. To discard these changes and return to the main menu, select Cancel. To accept these values and begin a new PA2 analysis, select NEW. If a PA2 analysis was already begun before entering this set-up, selecting NEW will close/save the existing PA2 batch and begin a new one with a batch name containing the next higher number. If NEW is selected, a PA2 icon will appear on the gage's display as shown. The gage BEEPS twice, and the resultant measurement value is displayed in large numerals at the bottom of the display. - the total number of individual measurements taken in the current spot so far. - the average of all measurements in the spot. This is the PA2 spot measurement value. - the average of the spot values i.e. the "average of the averages". - a Pass (√) or Fail (X) determination is made for the BATCH. If all PA2 criteria from Step 2 have been met, the pass symbol (√) will appear in the row above the spots. For more detail select "View" from the Memory Menu to display all individual measurements. The last measurement values are displayed first. Scroll using the up and down buttons. To move onto the next SPOT location select "New Spot" from the gage menu. (Shortcut: press "+"). 1. Upload readings to PosiSoft.net. All PA2 information is presented including gage serial number, PA2 parameters, individual measurements with date and time stamp, calculated averages, and Pass/Fail conclusions. View, annotate, and delete individual readings, and print reports. See below image for results from a sample report. 2. View and print reports offline using USB Mass Storage. All PA2 information is presented including gage serial number, PA2 parameters, individual measurements with date and time stamp, calculated averages, and Pass/Fail conclusions. See below image for results from a sample report. 3. Print to the optional Bluetooth printer. All PA2 information is presented including gage serial number, PA2 parameters, individual measurements with date and time stamp, calculated averages, and Pass/Fail conclusions. 4. Legacy Method : All stored measurements can be downloaded to your PC using PosiSoft software. PosiSoft allows entry of notes and annotations, prints and displays basic charts and histograms, saves measurements to your PC, and exports measurements to a spreadsheet or documents. Select the "Delete" menu option to erase a SPOT, a BATCH, or the entire contents of gage memory. Select the "Close" menu option to end a PA2 analysis but keep all existing BATCHES, SPOTS and measurements. 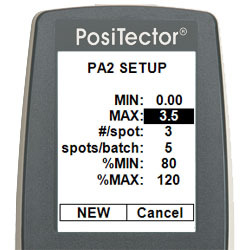 A gage RESET will restore PA2 parameters back to factory settings (see the instruction manual for RESET details). 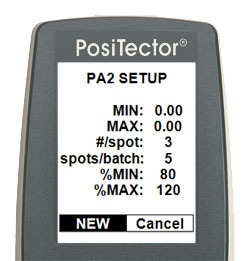 The PosiTector 6000's PA2 feature is intended to support the PA2 Application Standard, not replace it. It is the responsibility of the user to read and understand the document, and to verify the accuracy of the gage's conclusions. SSPC was founded in 1950 as the Steel Structures Painting Council, a non-profit professional society concerned with the use of coatings to protect industrial steel structures. In 1997, the name of the association was changed to The Society for Protective Coatings to better reflect the changing nature of coatings technology and the ever-expanding types of construction materials. SSPC is the only non-profit association that is focused on the protection and preservation of concrete, steel and other industrial and marine structures and surfaces through the use of high-performance industrial coatings. SSPC is the leading source of information on surface preparation, coating selection, coating application, environmental regulations, and health and safety issues that affect the protective coatings industry. SSPC standards, guides, specifications, and other technical documents are developed in accordance with voluntary consensus procedures established by SSPC Technical Committees. They are intended to represent a balance of interests, and are believed to represent good current practice. All documents are monitored and revised as practices improve. 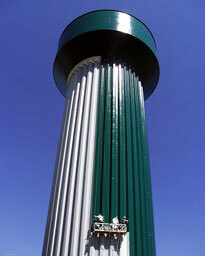 The SSPC organization has developed a series of Paint Application Standards, Guides and Specifications. One of them is entitled, "SSPC-PA 2, Measurement of Dry Coating Thickness With Magnetic Gages". It is among the most widely used SSPC standards. (click here to purchase the document). PA2 describes the procedures to measure the thickness of a dry film of a nonmagnetic coating applied on a magnetic substrate using commercially available magnetic gages. However the described methodology can be used by most non-destructive coating thickness gages including those using eddy-current or ultrasonic principles. The standard defines a procedure to determine if the film thickness over an extended area conforms to the minimum and the maximum levels specified. This procedure may be modified when measuring dry film thickness on overcoated surfaces. Substrate Roughness, Tacky Films, Curvature, etc. PA2 was originally developed to analyze large, flat surfaces. But concerns about other shapes and sizes prompted the creation of appendices. Appendix 1 - Numerical Example of Average Thickness Measurement. Appendix 4 -similar to Appendix 3 except that the pieces are painted in a shop. Appendix 5 -Method for Measuring Dry Film Thickness on Coated Steel Test Panels. Appendix 6 -Method for Measuring Dry Film Thickness of Thin Coatings on Coated Steel Test Panels that Had Been Abrasive Blast Cleaned. Gage Reading: A single reading at one point. Spot Measurement: (sub-batch) The average of at least three gage readings made within a 4 cm (1.5 inch) diameter circle. Dry Film Thickness: (batch) The average of at least five spot measurements for every 10 m2(100 ft2). i.e. the "average of the averages". Calibration: The controlled and documented process of measuring traceable calibration standards and verifying that the results are within the stated accuracy of the gage. Calibrations are typically performed by the gage manufacturer or by a qualified laboratory in a controlled environment using a documented process. Click here to see a full set of measuring definitions. TYPE 1 Gage: A magnetic pull-off gage such as the PosiTest. TYPE 2 Gage: An electronic gage that uses electronic circuitry, such as the PosiTector 6000. 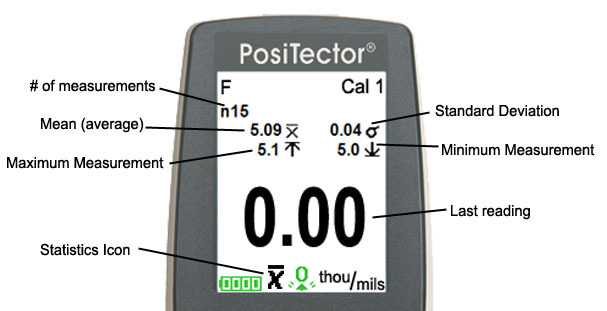 Calculate the average of several measurements -- the PosiTector 6000's Statistics mode. 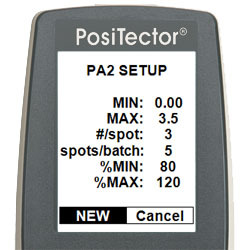 Analyze a larger area using a statistical approach -- the PosiTector 6000's PA2 mode. A large surface usually cannot be characterized accurately by a single measurement. Variations in substrate preparation, painting technique, measuring technique, etc. require an analysis of several measurements taken over a large portion of the surface. 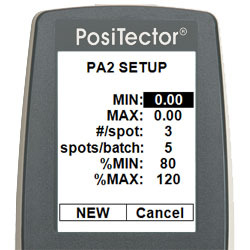 The PosiTector 6000's statistics mode displays individual measurements AND maintains a running average value. It also displays minimum and maximum values. 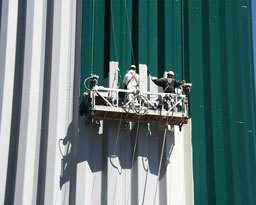 The SSPC organization has taken this a step further by developing a specification for structural steel painters. Known as PA2 this specification has become widely used both inside and outside the structural steel painting industry. PA2 helps determine if film thickness over an extended area conforms to user-specified minimum and maximum levels. It recommends that a coated surface be sectioned into one or more large test areas. A minimum of 15 individual measurements are taken in 5 groups of 3 measurements each. Suggestions are made as to the acceptability of individual measurements, spot measurements (the average of each group), and the calculated average of the spot measurements. In simple terms, PA2 suggests the average of a series of average values be used to determine if a target thickness has been met. Repeated gage readings, even at points close together, often differ due to small surface irregularities of the coating and the substrate. 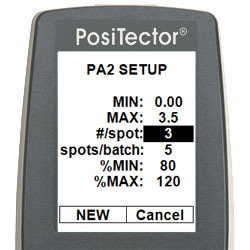 Therefore PA2 suggests a minimum of three (3) individual gage readings be taken for each spot measurement of the coating. These readings are to be taken within a 4 cm (1.5 inch) diameter circle. 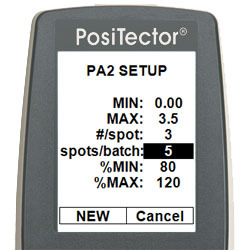 Advanced (3) versions of the PosiTector 6000 have a PA2 mode that helps the user collect measurements in conformance with the PA2 standard. Then, based on user-set parameters that include the target thickness, the gage indicates a pass or fail condition. How does the gage do this? 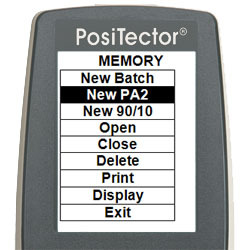 The PosiTector 6000 has on-board memory into which all measurements are stored. Individual measurements are grouped into "spots" (sub-batches). A series of spots are grouped into "batches". The film thickness result obtained from each batch, the "average of the averages", is taken to be the representative film thickness over the defined area. The gage continually monitors thickness results and reports a pass/fail condition on the current spot and on the batch as a whole. 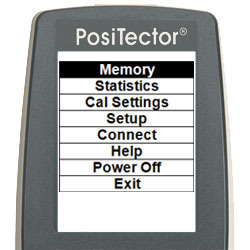 PosiTector 6000 Advanced models have a statistics mode. When selected, the gage continuously updates running average and standard deviation calculations. Maximum and minimum values are also tracked while measurements are being taken. The last measurement can be deleted with the (-) button, while the (+) button clears all statistics. Is it possible for all the spots to PASS but for the batch to FAIL? Yes. The pass/fail criteria for a spot is less stringent than for a batch. PA2 allows spot values to under run the target thickness by as much as 20%. The batch value cannot. Is it possible to change PASS/FAIL criteria after all measurements have been taken? No. Once the PA2 criteria has been set, the parameters cannot be altered. Select a New PA2, enter the desired criteria and repeat the measurements. Can I delete a bad measurement? Yes. Use the (-) button to delete the last measurement taken. Use the "View" menu option to delete any measurement, spot, or batch. Use the "Delete" menu option to delete spots, batches or the entire contents of memory. Must I specify both a minimum and a maximum thickness? With many of the coatings used today it is a good practice to specify both. This range is usually obtained from the coating manufacturer's technical data sheet. But economic factors along with flow characteristics of the coating usually control excessive film build, so it is common to specify only a minimum thickness. When only a single target value is available, set the MIN to that value and set the MAX to 0.